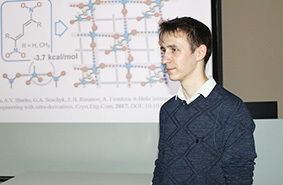 Sergei Sobalev conducts his research under scientific supervision of Dr. Prof. Ekaterina Bartashevich (the Department of Theoretical and Applied Chemistry, South Ural State University) and is now interning at SCTMS. In the report, he talked about a pnictogen bond as a type of a directed non-covalent interaction of electrostatic character, where a covalent-bonded atom of a pnictogen (N, P, As, Sb) plays a role of an electron density acceptor. Initially a pnictogen bond (PnB) is occurred because of increased value of electrostatic potential of a nitrogen atom in nitrogroup (π-hole). As a result, a nitrogen atom prefers to interact with nucleophilic fragments of neighboring molecules in a crystal. The research team wherein Sergei Sobalev participates drew a number of conclusions on positions and interactions of nitrogroups in pnictogen bonds. The researchers of the Laboratory of multiscale modeling of multicomponent functional materials are the experts in the field of quantum simulations. The premises for cooperation between them and SCTMS research team emerged long enough, for experience exchange in quantum computing, as well as for organizing complex research including database analysis and topological computations in molecular crystals.